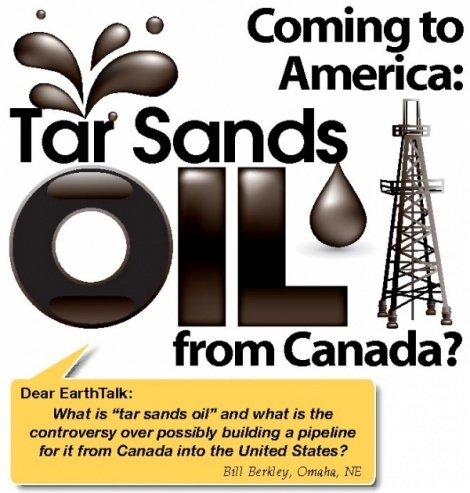 Tar sands oil or (“tar sands”) is slang for bituminous sand, a mixture of sand, clay, water and an extremely gooey form of petroleum known as bitumen, which resembles tar in appearance. Extracting commercially viable crude oil from tar sands is especially difficult because the thick and sticky mixture won’t flow unless it is heated or diluted with other hydrocarbons. Turning the extracted bitumen into liquid fuel requires large inputs of energy; the process also uses, pollutes and wastes large amounts of fresh water. Research has shown that these processes alone generate as much as four times the amount of greenhouse gases per barrel of final product as the post-extraction production of conventional oil. Taking the entire life cycle of both final products into account, the extracting , processing and burning of liquid fuel from tar sands emits between 10 and 45 percent more greenhouse gases overall than conventional crude. Extraction of oil from tar sands also damages land to the point where it can no longer sustain forestry or farming. Despite the environmental pitfalls of harvesting oil from tar sands, those countries that have them are making the most of them. More than half of Canada’s relative sizable oil production comes from the tar sands of Alberta and other areas, while Venezuela is also a big producer of tar sands oil. Tar sands have been in the news of late because green groups and many U.S. public officials are worried that the construction of a new pipeline to transport tar sands crude from northeastern Alberta into the U.S. —TransCanada’s Keystone XL project—would greatly increase American consumption of this carbonintensive fuel and jeopardize U.S. efforts to reduce its oil consumption and overall carbon footprint. Plans call for running the 2,000-mile-long pipeline all the way from Canada to Gulf Coast refineries. On the way it will carry as much as 900,000 barrels of oil per day, passing through six U.S. states and possibly jeopardizing the integrity of farmland, public water sources and wildlife habitat. In June 2010, 50 members of Congress signed a letter asking Secretary of State Hilary Clinton to block approval of Keystone XL because it would “undermine America’s clean energy future and international leadership on climate change.” The U.S. Environmental Protection Agency subsequently announced that the State Department’s draft environmental impact study for Keystone XL was in need of revision be cause it didn’t sufficiently take into account oil spill response plans, safety issues and greenhouse gas concerns.